How would you like to remember Ed Mirvish? 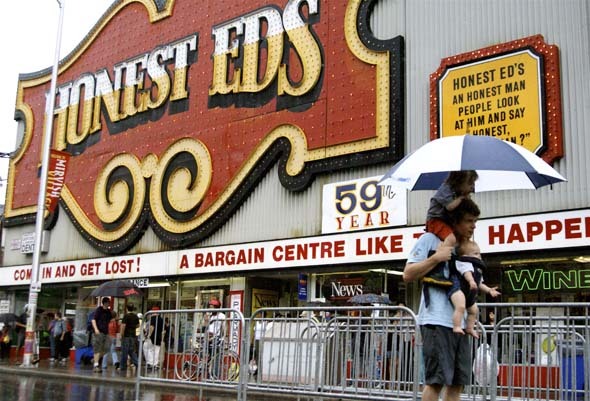 On Sunday the city of Toronto threw a street party in celebration of the life of "Honest" Ed Mirvish. Bloor Street between Bathurst and Markham Streets was closed off for the celebrations in front of his retail emporium. Mayor David Miller proclaimed the day official Ed Mirvish Day in celebration of the humanitarian, retail innovator and impresario. Perhaps it was his bargain-basement prices at Honest Ed's that enabled you to get through school on the cheap. Maybe the annual free turkey giveaway made your Christmas one year? Or did one of his theatrical productions give you your first big break? How did Ed Mirvish touch your life? "Three generations of women in my family have clothed and fed our kids due to Ed Mirvish," says Candice Bond, who attended the day's celebrations with her four-year-old son Trevor. Niall Robertson and his sons Liam (4) and Adrian (9 months) stay dry on Bloor Street during Honest Ed Day celebrations in Toronto. The day was supposed to be a Pedestrian Sunday for Mirvish Village. But judging by the well attended celebration on the street, nobody missed out. A little rain tried to dampen the spirits, but the mood was upbeat throughout most of the afternoon. As I wondered about on Bloor Street I saw families enjoying themselves in spite of the inclement weather. Some of the kids seemed to enjoy the rain even more. 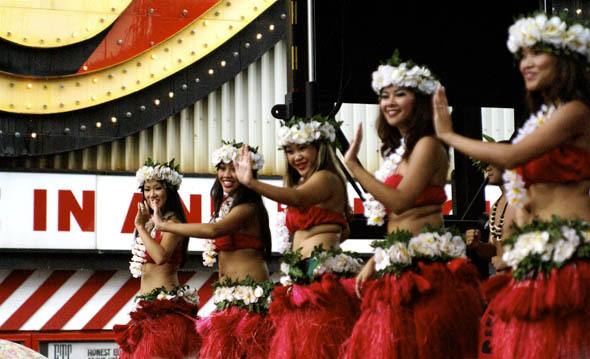 Among the festivities was Hawaiian Pacific Magic, a troupe of Polynesian dancers who have performed for Ed Mirvish on his birthday every year since he turned 80. Ed Mirvish passed away about a month ago at the age of 92. How did Ed Mirvish touch your life in a positive way? All photos by Roger Cullman.